I'm very excited to announce FIVE, a Rows Garden EP. 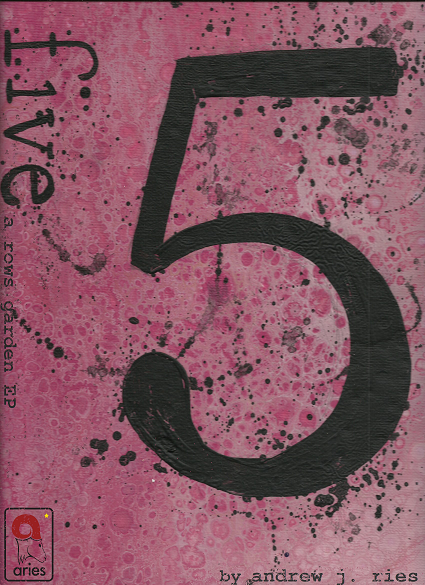 This is a collection of five original Rows Gardens written by yours truly to celebrate the fifth year of Aries Rows Garden. All of the puzzles (including one themed Rows Garden with a meta element) feature a unique twist on the number five. And it's available for just $5! For more details and to purchase, click here. Deviating from the standard Across and Down format of clues and entries, Rows Gardens offers its clues in two forms: Rows and Blooms. Each row, for the exception of the top and bottom, will have two entries consecutively; the first clue starts at the far left, and the starting point of the second clue is for you to determine. The top and bottom rows are a single entry, spanning the nine spaces provided. Intersecting these Rows are six-letter Blooms, segmented by the shade of the center dot: Light, Medium, and Dark. These answers can be placed clockwise or counterclockwise, and their starting points are left for you to determine.For additional assistance, notations like (2 words) or (Hyph. ), usually not given in standard puzzles, are provided in the clues. Clues that do not have a notation are standard one-word, non-hyphenated entries. In the Harder version of the puzzle, Blooms' clues are listed in alphabetical order, so their placement is reliant upon getting the answers to the Rows clues. In the Easier version, the Blooms' clues are listed in the order they appear in the grid, always going top to bottom, left to right. In 2014, I added two additional levels of difficulty. In the Hardest version, there are no notations providing number of words, if hyphenated, etc. The Blooms are listed in alphabetical order. Only confident Rows Gardeners should attempt to solve using this version. In the Easiest version, there are enumerations provided instead of notations. For instance, if RED ROSE was the answer, it would include the enumeration (3, 4) after the clue. Blooms are listed in order they appear in the grid, top to bottom and left to right. If you are new to Rows Gardens, I would suggest starting with this version. (c) 2010-2019 Aries Puzzles. Simple theme. Powered by Blogger.